Leather, a material made from tanned animal hides, has been used as clothing since the earliest days of human existence. Prehistoric people wrapped animal skins around their bodies for warmth and to absorb the magical powers that they believed the skins imparted to them. Phoenician sailors often brought brightly embroidered leather garments from Babylonia to the countries they visited. Leather shoes were found in the tombs of Egyptian pharaohs. Soldiers of the Roman Empire invaded the lands of northern Europe and discovered Teutonic nomads wearing leather garments as protection against the harsh elements. When these soldiers returned to Rome with leather pants, the toga-garbed officials of the city tried to ban their use, but to no avail. Romans were soon using leather for shoes and tunics as well as for breastplates and shields. In fact, the first recorded tanning guild was formed in the Roman Empire. In the Middle Ages, the Moors introduced the European world to softer Cordovan leather which they made from goatskin. By the Renaissance, tanners' guilds had been organized all over Europe. The Mayan, Incan, and Aztec cultures in Central and South America also used leather, as did the American Indians, who sewed garments from buckskin, doeskin, and buffalo hide. During the Stone Age, garments were held together with leather straps that had been threaded through holes punched in the hide with crude implements made of stone. The hides were stiff and did not last long before putrefaction made them unwearable. Later, people learned to soften the hides by rubbing them with animal fat and used stones to clean the animal cells from the skins. It is also possible that in trying to dye the skins with various substances, early people discovered further preservation methods. Preservation methods have varied over the centuries. Hides have been smoked, salted, soaked in urine, rubbed with animal dung, beaten, and dragged over sharp sticks. Prehistoric people and some modern Eskimos have even resorted to chewing the skins to remove hair, pieces of flesh, and ultimately, to soften the leather. In some cultures, the skins were sprinkled with talc and flour to replace the natural oils. Women's leather garments were often doused with perfumes. Although leather was a valuable trade commodity, the tanning work was dirty and odorous, and leather workers were usually relegated to the outskirts of town. Ancient Hebrews are credited with inventing the first tanning process using oak bark. The American Indians used fish oil for the same purpose. American colonists found that plants such as the hemlock and chest-nut trees could also be used for tanning. In the 19th century, machines were developed to perform these processes and an American chemist developed a tanning method using chromium salts that cut the processing time from weeks or months to just a few hours. used to make leather jackets. As soon as the skin is removed from the animal at the meat processing plant, it is refrigerated, salted, or packed in barrels of brine. It is then sent to the tannery where the skins undergo a series of processes designed to preserve and soften the hides. The work performed at the tannery is of utmost importance to insure that the resulting garment is of high quality. Sewing materials such as thread, lining, seam tape, buttons , snaps, and zippers are generally purchased from outside vendors and stored in the garment factory. 1 The skins are trimmed and sorted according to size, weight, and thickness. It is necessary to remove any remaining proteins that could stimulate the growth of bacteria. To this end, the skins are soaked in revolving drums filled with water, bactericides, and detergents. Hair is removed with the application of chemical sprays or lime solutions. A scudding machine fitted with dull blades scrapes off any excess hair. Another round of washing (de-liming) removes these chemicals before the hides are soaked in an acid solution and then bated, an enzyme treatment to further remove the skins' collagens. Finally, the hides are pickled with salt and sulfuric acid. 2 The hides undergo one of three types of tanning. Vegetable tanning requires the most time with the skins soaked in progressively stronger tannic acid solutions for several weeks. However, some soft leathers, such as lambskin, may be soaked for as little as 12 hours. Mineral tanning is significantly faster but can change the color of the leather. For this method, the skins are placed in alum salt-filled drums fitted with paddles that provide a constant agitating motion. 3 After the skins have been tanned, they are washed once again and wrung out thoroughly. Then the skins are passed under a band knife, which cuts the skins to a uniform thickness, and placed on conveyer belts which carry them to drying tunnels. Usually, the skins are stretched on frames to prevent shrinkage during the drying stage. To combat the stiffness that drying produces, the hides are sprayed with water and soap and allowed to hang for a period of time. After the skins have been conditioned, they are placed in machines designed to rhythmically manipulate the leather so that the fibers are further loosened and made more flexible. In the final drying period, the hides are hung in vacuum-drying cabinets. When the skins are thoroughly dried, they are buffed with revolving steel cylinders covered with abrasive paper. Suede finishes are produced by passing the hides under high-speed emery wheels. At this point, glazes, dyes, and lacquers are applied. The skins are now ready to be sent to the garment factory. The development of high-speed sewing machinery changed the face of traditional sewing factories where one person may have worked on a single garment from start to finish. Because leather garments are considered luxury items, hand-construction by highly skilled artisans is still sought by many consumers. However, the following steps are those used in factory mass production. 1 Garment manufacturers typically employ designers to create patterns from which the clothing is made. Computerized machines grade the designs according to government anthropometric tables which assign sizes based on body height and weight. The computer then produces patterns in a range of sizes from the original design. 2 The tanned leather is placed on moving tables called spreaders. Although modern technology allows several layers of fabric to be cut simultaneously, leather is usually cut one layer at a time. The pattern is placed on top of the leather. This is accomplished in one of two ways; tissue-paper patterns may be pinned onto the leather, or the pattern may be marked with tailor's chalk. The spreading table works on the conveyer system, moving the fabric to the cutting machine, which is fitted with either rotary blades or band-knives. The table is either guided by a human operator or run automatically. The most recent technological advance is the computerized laser beam system in which the fabric seams are vaporized rather than cut. Lining material for the jacket is cut in the same manner. Because it is of a much thinner weight, lining can be placed on the spreaders in multiple layers. 3 The jacket is assembled in roughly this order: the sides are stitched to the back portion, sleeve underseams are stitched together, and the sleeves are attached to the armholes. 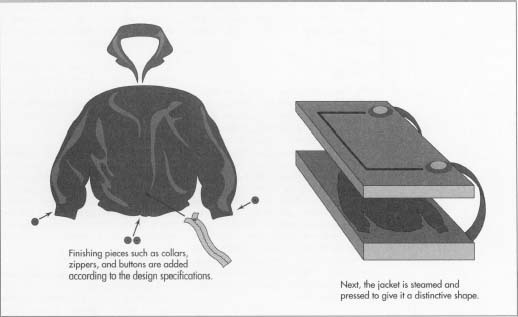 The attachment of finishing pieces such as collars, cuffs, buttonholes, buttons, zippers, and pockets varies according to the design of the jacket. Patch pockets are sewn onto the side pieces before they are stitched to the back portion, and side pockets are sewn in at the same time that the sides are attached to the back. Generally, lining material is attached to each piece before it is sewn onto the jacket. In mass production, the pieces are moved along a highly sophisticated production line using integrated automatic sewing machines that are capable of sewing as many as 8,000 stitches per minute. 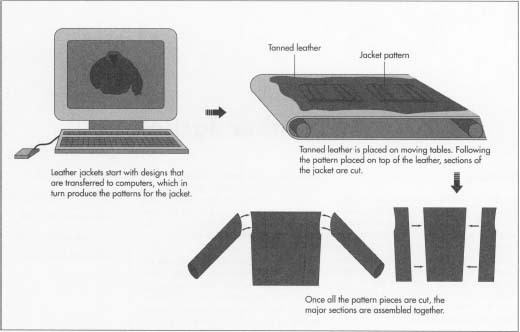 In a sequential system, one sewing machine stitches a particular section of the jacket and then moves the garment to another sewing machine which performs the next step. For example, after one machine stitches a cuff to the sleeve, the sleeve moves to another machine where it is attached to the jacket armhole. A tandem sewing system calls for two or more machines to work on the same garment simultaneously. In this instance, one machine attaches buttons to the front of the jacket while another machine applies the collar. Each step, from setting thread and needle positions to aligning the fabric to extracting the sewed materials, is pre-programmed. Each sewing machine is equipped with under-bed trimming devices that automatically knot and cut threads after each seam is sewn. Excess threads are carried away to waste receptacles by streams of compressed air. Operators regulate the work at each station with a modified presser-foot or from a control panel. A stop-motion device allows the operator to halt production to make adjustments such as replacing broken threads or needles. 4 A number of pressing processes incorporating heat application, steaming, and blocking are employed to complete the transformation of the animal skins into a jacket. Buck presses equipped with controls and gauges to regulate the amount of steam and pressure are used to give the jacket its distinctive shape, whether a bomber- or blazer-styled jacket. Curved blocks are placed around the collars and cuffs and then heat is applied. The blocks are removed, leaving the collars and cuffs curved. 5 Each jacket is inspected by hand before it leaves the factory floor. The completed jackets are then sheathed in plastic bags, packed into cartons, and shipped to the retailer. The thoroughness of the tanning process is designed to produce skins that are supple and free of bacteria-causing proteins. Garment manufacturers inspect each shipment of skins for marks, tears, stains, and imperfections. Today's automated sewing systems are self-correcting. Sophisticated lubricating systems composed of pumps, reservoirs, fluidic controls, and electronic controls insure that the garments are manufactured at a consistent level of quality. Although the leather goods industry suffered slightly during the most recent recession, and merchandisers were compelled to implement discount strategies, the Leather Apparel Association predicts a strong comeback during the last decade of the 20th century as many companies expand their clothing lines. New technologies such as the laser cutter are also increasing the rate of production. As with the fur industry, the leather industry has been the target of some animal rights groups who denounce the killing of animals for human benefit, particularly to create "luxury" items. In an effort to address these concerns, some clothing manufacturers have increased production of artificial leather, a material made from synthetic fibers, which does not use any animals and is less expensive. However, jackets and coats made from real leather remain fashionably popular. Parker, Xenia Ley. Working with Leather. Charles Scribner's Sons, 1972.